My last blog post was about the importance of reflection, and how it is the best tool for anyone who wants to teach. I try to take my own advice and engage in reflection during my workdays. Supporting adult students’ learning is sometimes harder than supporting the learning of younger students. As adults we have stronger preconceptions about our learning abilities and preferences, based on the previous educational experiences. Sometimes these unwritten rules make effective learning harder. Today I red about an amazing book and found their website: Contextual Wellbeing is such an important concept for education today! Focusing on important (instead of urgent) improves the outcomes of most processes. Learning process is no exception of this rule. Shifting focus from competitive educational model to equitable educational communities that emphasize contextual wellbeing is the challenge. Making education better requires a systematic change, and changing focus from learning products to learning process. However, we all can make small changes in our own instructional settings and improve the learning experiences our students have. My common request for my students is that they pay forward the learner-centered education with non-punitive assessment system they have experienced. It is much harder to to change to learning- and learner-centered education if you have not experienced it. We all tend to instruct in the way we were instructed, unless we reflect on our dispositions and practices. Yet, as teachers and faculty we all can take small steps towards this direction by focusing on supporting learners autonomy, relatedness and copetency. Supporting adult learners includes the same components of respect and compassion as all other teaching, and builds similarly on 3Cs: The cognitive learning approach combined with constructive and cooperative practices that enable effective teaching and meaningful learning. C1 – Cognitive approach makes supporting adults’ learning easy and effective. Viewing learning as a student-centered and dynamic process where learners are active participants, it strives to understand the reasons behind behavioral patterns. Discussing values and mental models is the first step. Talking about forethought, performance control, and self-reflection helps students to improve their academic performance by learning how to self-regulate their behavior, engagement and learning. Having conversations about the hierarchy of concepts in learning material and providing support to create graphic organizes and mental models is an important part of the learning support. Establishing and resetting process goals and completion goals, as well as discussing conditional goal setting is important! C2 – Constructive practice emphasizes the learning process and students’ need to construct their own understanding. Interactions are the basic fabric of learning! Delivered or transmitted knowledge does not have the same emotional and intellectual value. New learning depends on prior understanding and is interpreted in the context of current understanding, not first as isolated information that is later related to existing knowledge. Constructive learning helps students to understand their own learning process and self-regulate and co-regulate their learning in the classroom and beyond. Regular feedback, self-reflection and joint reflection with respect and compassion are important! Teachers’ strong pedagogical content knowledge is a prerequisite for successful constructive practice. C3 – Cooperative learning is about holistic engagement in the learning process. The guiding principle is to have learning-centered orientation in instruction and support. Students learn from each other and engage in collaborative meaning-making. Every student has their own strengths and areas to grow, and growth mindset is openly discussed in class. Teaching and learning become meaningful for both teacher and students, because there is no need for the power struggle when interactions are based on respect and compassion. From students’ perspective cooperative learning is about respecting the views of others and behaving responsibly while being accountable for your own learning. At best this leads to learning enjoyment, which is a prerequisite for life-long learning: why would we keep on doing something we don’t like? In 21st Century nobody can afford to stop learning. The discussions I have with my grad students are amazing. Every day I talk with teachers who have so much passion for their work, so strong dedication for making learning better for their students, and such a drive to gain more professional knowledge. I am privileged to support my students’ learning process by engaging in dialogue with them. Of course, there are also teachers whose goal is just to pass their courses and earn their degree by demonstrating their existing competencies, and the dialogue with these students is different. As a faculty member I respect their strategic learning approach, but also offer opportunities to engage in deeper learning discussions and support their learning process and wellbeing. The best tool I have found for supporting adult students’ learning process and contextual wellbeing is open and honest communication. I try to open the dialogue by listening what my students are thinking, and expanding their knowledge of curriculum, instruction and research by communicative interactions. This is what I think pedagogy and andragogy are really about: supporting students’ deeper learning in dialogue. As teachers we know the mechanisms of teaching and learning. In classroom we must choose which instructional practice to use to help our students to learn. What worked yesterday may or may not work today or tomorrow, because learning depends on the classroom situation and context. These decisions are often value judgments. This is why reflection is so crucially important! Knowledge of the instructional process, learning process, and assessment are the three cornerstones of teaching practice. However, these three create a tad wobbly foundation if we omit the importance of personal and professional reflection. Teaching is work done with our personalities – there is no denying this! Students perceive us as a part of the learning environment, no matter what we do. How we engage in the instructional process and learning process are the most important things to reflect upon after every workday. (Yes, these are two VERY different processes!) Reflection doesn’t have to be anything very time consuming or fancy (I know how busy teachers can be), but you shouldn’t walk away from your class or lesson without spending a minute thinking about it. Skipping reflection is like closing a word processing program without saving your work! Thinking about these three things and making a note about the change will help in future planning sessions. I often email myself things to be remembered, and I have a separate email account just for the notes from myself. Doesn’t matter whether you want record your reflections in a notebook. Just do it! Reflection gets even better if we get to do it with a colleague. They may have insight into why students behaved differently, or a suggestion for what we might want to change in our teaching practice. Maybe they have tried different instructional strategy in a similar situation, or maybe they have diverse insight into learning process. As teachers we are engaging in lifelong learning. Not only because education changes when culture changes, but also to update our own competence. I don’t know any teacher whose thinking about the profession has not changed since the day they started teaching. If you haven’t made a New Years resolution yet, why not give reflective practice a try? p. 255 in Guerriero, S., & Révai, N. (2017). Knowledge-based teaching and the evolution of a profession. In S. Guerriero (Ed.). (2017). Educational Research and Innovation: Pedagogical Knowledge and the Changing Nature of the Teaching Profession (pp. 253-269). OECD Publishing. Sometimes we have too narrow view of the teaching profession. Successful teaching is so much more than just delivering the curriculum or course, or lecturing about the content. There are several necessary competencies for anyone who wants to teach – whether in early learning, K-12, higher ed, or in the training department of a business. In OECD Teacher Knowledge Survey (TKS) these competencies were divided into three dimensions: instructional process, learning process, and assessment . It makes very much sense to keep these three separate from each other, because they relate to different aspects of teaching-learning interaction. Instructional process is the part of delivering information, learning process is where the learning actually happens, and assessment is where the results of the learning process are measured. The table below shows the competencies in their respective dimensions. It is important to remember that the instructional process and learning process are two different things: instruction is about delivering information and learning is about acquiring it and elaborating , so that the information becomes learners’ subjective knowledge, which obviously is different for each individual student. This is why we should consider learning objectives to be just guidelines showing us what is the basic competency level. The “real” learning often happens after studying has been done, and the newly gained knowledge is used in real-life settings and combined with all existing knowledge and experiences of the student. This is what “deep learning” means: reconstructed personal understanding of the topic. While it is great to have excellent content knowledge about the topic you are teaching, it is only one part of the pedagogical (or andragogical) knowledge needed for good teaching. Building skills to support students’ learning process is a crucial part of teachers’ professional development. Acquiring the scientific knowledge of learning process, attributions, dispositions and development is a big part of keeping teaching competency updated, to avoid falling into minimazing learning to become a product to be displayed. When learning is predominantly perceived to be a product (essay, test, project, exam, etc. ), the emphasis lies on instruction and (standardized) measurements of “learning”, where each student is expected to possess the same knowledge as evidence of teaching-learning interaction being effective. What if student X already possessed the knowledge before starting the class/course/training? What are we really measuring in this case? Certainly not the quality of learning or teaching! Effective use of teachers’ pedagogical knowledge includes planning of instruction to support the information delivery (whether flipped, direct instruction or some other form of exposing students to the content), construction of safe and supportive learning environment where students can self-regulate and focus on the acquisition and elaboration process of their new knowledge, and non-punitive assessment methods to measure students’ individual learning processes. This certainly is NOT a one-size-fits-all-approach for education or training, but much more effective and enjoyable learning experience for both students and teachers. The knowledge dynamics of teaching profession have already changed when the infromation era began. Today teacher learning should focus on all areas of pedagogical knowledge, emphasize connecting reseearch to practice, and support teachers’ ownership of their practice . Deep Learning focuses on understanding connections in the contect, and aims to create permanent knowledge studenture by relating new information with existing one. This is a learning approach that can be fostered among learers of all ages. Learning: Process or product? Learning happens all the time, everywhere, yet we try to make formal learning different from all other learning experiences. Maybe we shouldn’t. Self-Determination in Learning is like SDT in any other situation: it requires autonomy, relatedness and competency. This is also the premise of gamification to work in education. Importance of Choices Having choices is the prerequisite for ownership. Optimal level of structure and choicesin classroom increases meaningful learning experiences and teacher-student interactions. Learner Agency improves the quality of students’ engagement in their own learning process. Without engagemnt there is not much learning happening. Illeris, K. (2018). A comprehensive understanding of human learning. Contemporary Theories of Learning, 1-14. It easier to teach something you have experienced firsthand. This is why teachers’ learning should reflect the ways we wish their students to learn. Instruction is situated in one’s own experiences. Truly focusing on life-long learning. Teachers as learning professionals still need occasional reminders about how to support their own learning process, because in the professional world the expectations for showing competence by generating learning products (evidence, projects, artifacts, exams, etc.) sometimes take over the deep learning process, and thinking about how learning really happens, and how it can be supported on personal level. Knowledge of metacognitive skills is an essential tool for anyone who wants to teach. Metacognitive awareness includes the knowledge and perceptions we have about ourselves, understanding the requirements and processes of completing learning tasks, and knowledge of strategies that can be used for learning. Teaching metacognitive knowledge and skills is an important part of supporting deep learning. We as teachers should have extensive knowledge and skill to embed metacognitive strategies into our everyday practices. Just like classroom learning experiences, also teacher learning should be designed to support self-regulated learning (SRL) practices. SRL refers to students’ cognitive-constructive skills and empowering independent learning, focusing on strengthening the thoughts, feelings and actions that are used to reach personal goals (Zimmerman, 2000). This approach aligns well with the research of adult learning, which highlights the use of constructive-developmental theories (e.g. Mezirow, 2000; Jarvis, 2009; Stewart & Wolodko, 2016). Supporting students’ SRL becomes easier to embed into instruction when we have first practiced in our own learning. This cannot be achieved by following a script or curriculum book, but situating the knowledge of pedagogy in classroom practice. Using SRL as a chosen approach in professional development or other learning opportunities helps to recognize our own fundamental beliefs about learning. These beliefs, that either help or hurt learning process, are always present in both teaching and learning situations. Following the three steps of SRL helps us to approach learning tasks within their context, and first create a functional plan and choose learning strategies to support learning process. Then, we will want to monitor our own performance and learning process during the second part, performance phase. This is where the knowledge of deep learning strategies is very important, because sometimes instruction and design reward surface processes, and we might want to change our strategies to still engage in deep learning. In the third phase, self-reflection, is the most important one, but often forgotten. Without engaging in self-assessment about our own learning process, it would be hard to do things differently next time, if needed. Yet, the whole idea of using metacognitive knowledge to improve deep learning relies in dealing with our own perception and managing our emotional responses, so that our beliefs about deep learning are strengthened. Some beliefs are detrimental for deep learning, and for example mentally punishing ourselves (for failure, procrastination, etc.) leads toward using surface learning processes. Instructional approaches that emphasize choice, learning ownership, knowledge construction, and making connections are more likely to facilitate deep learning and understanding – for teachers and students alike. Here is more information about SRL for adult online learners in a PDF form. Jarvis, P. (2009). Learning to be a person in society. In K. Illeris (Ed.) Contemporary theories of learning: learning theorists… in their own words. London: Routledge. Stewart, C., & Wolodko, B. (2016). University Educator Mindsets: How Might Adult Constructive‐Developmental Theory Support Design of Adaptive Learning?. Mind, Brain, and Education, 10(4), 247-255.
perspective, in M. Boekaerts, P. Pintrich, and M. Zeidner (Eds.) Handbook of Self-regulation (pp. 13–39). San Diego, CA: Academic Press. Learning and teaching in 21st century should definitely be fueled with something much more than fear, force and artificial authority. After all we want for students to have strong integrity and self-confidence. And the curricula and evaluations, in addition to the classroom management practices, have been designed for students to benefit from the time they spend in the school. Right? The scary part is that even today, more than one hudred years later, the same methods of fear, force and artificial authority are still well and alive in the schools around the world. Why? Maybe it is easier to convince students about the importance of doing well on tests by instilling the fear of not being able to get admitted to a reputable college/univeristy/workplace unless the test scores demonstrate brilliance? Maybe it is easier to control student behaviors by displaying artificial authority of being the keeper of the scores or grades? But, from decades of research and practice we know that students learn better when they learn in an environment that is safe, supportive and collaborative. And we don’t need “servile helots”, but critical thinkers who will thrive in the 21st century environment where information and choices are more abundant than ever before. The psychological research and practice have advanced very much during the past century. American Psychological Association has published the Top 20 Principles to be used at schools. What blows my mind is how few teachers have heard about these, or their predecessor Learner-centered Psychological Principles. Yet, I consider the APA to be the highest authority of educational psychology in the U.S. and a positive influence in the world in general. Cognition and learning: How do students think and learn? Social context and emotional dimensions: Why are social context, interpersonal relations and emotional well-being important to student learning? Context and learning: How can the classroom best be managed? Assessment: How can teachers assess student progress? All the 20 principles are displayed below in a table. What you do in your classroom – whether online on traditional – is your choice. The psychological principles are compatible with every subject and every curriculum. Why not give it a try and implement a safe, supportive and collaborative learning environment? Clark, R.W. (1971). Einstein: The life and times. New York: World. Learning process is anything but linear and visible. Best learning experiences are often messy and hard, but oh-so-rewarding. For education professionals it is sometimes nice to think about how the learning process is rolling forward like a simple cycle (like Kolb’s), and emphasize the perception and processing, but the reality is far more complex. 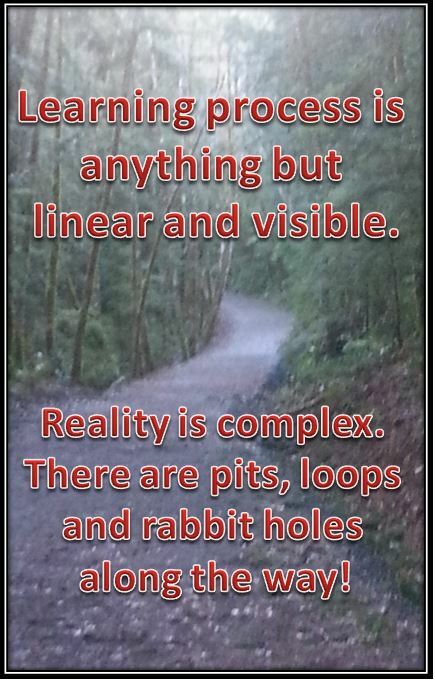 There are pits, loops and rabbit holes along the way. The discussion of learning process must include these invisible or intermediate processes of learning, and acknowledge the personal preferences that make learning stick. One size does not fit all. Our personal preferences for the intermediate processes of learning are the ways we prefer to perceive, choose, store, reflect and retrieve the data and information needed for learning. These preferences result from our previous experiences in life and learning, and they can either help or hinder our academic learning process (Green et al. 2012). Acknowledging the individual preferences and emphasizing the importance of metacognitive skills in learning helps to focus more on these invisible parts of learning process. Teaching the metacognitive skills could be called invisible teaching, because it requires significant amount of interactions between the teacher and the student – interactions that may or may not relate directly to the learning objectives. Learning happens everywhere. This must be acknowledged in curriculum design and instructional design processes, because without transfer to personal lives of students the formal learning is quite worthless. (This is obviously not a new idea, non scholae sed vitae has been around for a long time.) Unfortunately, teaching is sometimes seen as a simple act of delivering information. In such learning environments evaluations of learning (or performance) are based only on the tests, exams, essays, worksheets and other ways of demonstrating the mastery of the subject/topic. Grades are handed out to students in the end of term or semester, but what do these grades actually mean? Invisible learning could be called unvalued leaning, because it is not included in the evaluations conducted in formal education. To be effective, contemporary education must strive “to capture intermediate learning processes in student work,” not just outcomes (Bass & Enyon, 2009, p. 15). One way to broaden the evaluation of learning is to use performance assessments with rubrics, so that students know what they are supposed to demonstrate, and use all their knowledge in the tasks, not just a small, segmented amount of knowledge that belongs to that specific class. Bridging this informal or invisible/unvalued learning to formal education helps students to see their classroom learning more meaningful because it carries personal significance. Emphasizing invisible learning empowers students to engage in self-regulated learning and be more active in building their own, personal knowledge-base. What is the easiest way for invisible learning to become valued in your class? Bass, R. and Eynon, B. (Eds.). (2009). The difference that inquiry makes: A collaborative case study of technology and learning, from the Visible Knowledge Project. Academic Commons. Retrieved from http://academiccommons.org/). Invisible learning as a new paradigm or metatheory. I enjoyed reading Alfie Kohn’s critique about Dweck’s mindset because it made me think about how we empower students to engage in their own learning process. The article addresses points that are extremely important while using the mindset in the classroom, especially the pedagogical choices about focusing on traits like grit or supporting the individual learning process of each student. Mindset itself is important, but the way we discuss the growth mindset with students is even more important. Personally I find it controversial to focus too much on learning styles or personality traits like grit (other labels are extroversion, openness, impulsivity, etc, google MyersBrigg or Big 5 for additional information). This is because the contemporary learning theories highlight the subjectivity of learning, and the expected teaching dispositions are very clear about the need for all teachers to display the belief that every student can learn (regardless the personality traits students have). Furthermore, I prefer to focus on supporting my students’ individual learning processes, because this helps them to become independent learners. Every student, child or adult, has their unique set of skills and needs, and perception of their own strengths and areas of growth. Discussing the growth mindset in the classroom may help some students to adopt better learning dispositions and engage more deeply in their own learning process. It seems that mindset is a refined and renewed version of attribution theory and deals with students’ self-efficacy beliefs and locus of control. We all have had those students and parents with the firm belief how “nobody in our family has ever been good in math” or “everyone in the family struggles with reading”. When children hear these messages stated over and over again in casual discussions, they often start to believe that they couldn’t possibly learn math, or be fluent readers, because those attributions don’t belong into their family. These beliefs easily create self-fulfilling prophecies that can seriously harm students’ learning. Growth mindset can be an excellent tool to diminish these negative causal attributions and help students create a realistic (academic) self-concept. But, I don’t believe this can be achieved with something as simple and effortless as praise. Praise is normative by its nature. Praise implies that the student met an invisible norm, known or set by the subject matter experts (teachers, educators, parents, etc). Thus praise is always about evaluation, because it is an external judgement about what the student did or what the student is (doing referring to the growth mindset and being referring to the fixed mindset). In education we need to increase the use of assessments and self-assessments with clear criteria about expected outcomes of assignments, so that students know what they are supposed to achieve and don’t have to rely on hit-and-miss strategies. Evaluations are very much overused, which is problematic because they emphasize the control over students and their performance, instead of providing learning support or feedback about the learning process. The very first decision for every teacher to make before introducing the mindset to her/his students, is whether the mindset is used in the classroom to promote grit or to empower students to learn more. Using mindset to promote grit in the classroom is fairly straightforward: create standards and labels for appropriate behaviour (maybe checklists), and we are good to go and evaluate students’ behaviours, actions and displays of true grit for demonstrating their growth mindset. It is easy to quantify how many work sheets students have filled, or how many minutes they have engaged in the activities – and then praise the persistence in task (whether the task is meaningful for students is irrelevant in this environment). I can understand why effort-praising, grit-building growth-mindset practices are appealing: they appear to be a quick fix for the most important problem in education – student disengagement. I am sure we could build a robot to offer praise every time when a student displays gritty behavior! But doesn’t this kind of praise seriously underestimate our students as vibrantly intelligent, creative and curious human beings? While persistence is important in successfully completing tasks or projects, it certainly cannot be the most important ingredient in educating students to become productive citizens of 21st century! Focusing on empowerment in mindset discussions is harder and more time consuming for educators, because empowerment requires a dialogue between students and the teacher. It is about engaging in authentic interaction where both parties are heard. In this environment assessment becomes an opportunity for feedback and growth. I am currently working on my dissertation about learner agency in formal education, and these very same themes of empowerment are important for educating students who are “self-organizing, proactive, self-reflecting, and self-regulating, not just reactive organisms shaped and shepherded by external events” (Bandura, 1999, p. 156). To thrive in the with the constant information overflow in the world today, this active choosing (instead of reacting) is exactly what our students need to learn. We as teachers need to make informed choices about our pedagogical and instructional practices. Is it more valuable for students to remember that finishing all tasks gets them rewarded (with praise or grades), or to know that they can have an effect on their own learning process? This is a value level choice about the classroom practices we communicate to students with expectations and grading policies. So, when introducing the mindset in your classroom, please do think about the long-term goals. What do you really wish for students to gain from the mindset discussion? Carol Dweck revisited mindset stating that she may have “emphasized sheer effort too much”. Wonderful! Maybe this mislead educators to think that promoting grit is beneficial, and so it became this widely accepted misconception about contemporary learning! Bndura, A. (1999). Social cognitive theory of personality. Handbook of personality: Theory and research, 154-196. What is your teaching disposition? Providing a short answer to this question has always been a struggle for me, because so much falls under the concept of teaching disposition: values, beliefs about teaching and learning, interaction styles, even worldview. So, where to start? Those who have been following my blog already know that I am very passionately supporting student-centered learning and teaching, so obviously my teaching disposition focuses more on supporting students’ individual learning processes than anything else. Pedagogical skill is very high on my priority list. Believing that everyone can learn is one of the fundamental dispositions in contemporary education. This belief doesn’t always seem to fit perfectly with standardized testing, or labeling schools (and sometimes even students) as “failing”, based on a quantitative snapshot evaluation that tells very little if anything about the learning process (i.e. the learning quality). Being convinced that knowledge is much more than a fixed bunch of facts (information) brings another dimension to the dispositions because it defines the extent of our teaching. We must prepare students for the world that is a complex mixture of cultures and diverse beliefs, and while memorizing disconnected pieces of information may be a nice trick in trivia game, students also need to understand the contexts and connections of that information. Where did it come from, and is it trustworthy? And an especially important question is: how can we use it productively? Unfortunately the discussions about the nature of knowledge are seldom highlighted in professional meetings, but it should be. Misusing information is easy because it is shallow and has no situationality or contextuality – these are qualities of knowledge, where an individual has constructed an understanding of how given information fits into her/his worldview, beliefs and values. The use of labels falls into the category of misusing information, and it often leads into othering, which is how we define “us” and “others”. It is easy to sort people, categorize them and label their qualities. But, when we use labels and define the problem in education for example as underachieving students, it locates the solutions to fixing the students. Not education, nor instruction, but students. How scary! This is how something we know from research and experience to be beneficial for students, their learning and their future (e.g. bilingualism) suddenly becomes a problem (e.g. ELL, underachieving). Of course these diverse students score lower in the standardized tests. But their individual learning processes may be incredible. In order to effectively communicate to students about the importance of individual learning process, two additional parts of teaching dispositions must fall into place: keeping my bias in check, and differentiating for students’ needs – not for the labels we too often attach to students (you know: ELL, poverty, learning disabilities, behavioral needs etc etc). When we keep on othering, we point our fingers to students, label them, and provide remedial education — without checking our bias (is the problem really the student, or maybe the environment, instruction or context?) and without differentiating for students’ individual needs. This deficit thinking also seems to be the origin for the grit discussions. Have you noticed that nobody is asking for successful students to show more grit? It may be because they don’t need to persist, because they have gained the sufficient knowledge with informal learning, and are getting bored out of their minds in the classroom. But these seemingly successful students would really need to learn how to learn effectively something new, because nobody can be excellent in everything. Recent research also recognizes the importance of teachers’ interaction styles and skills as mediators for learning, and suggest that setting limits is more beneficial for students’ learning than guilt-inducing appealing to students emotions. This makes perfect sense from the viewpoint of dispositions: respecting the diverse needs and skills of learners also leads to offering every student an individual amount of freedom and choice and providing the information in student-sized chunks. So this is probably the shortest description of my teaching dispositions: focused on supporting students’ individual learning process I strongly believe everyone can learn, I do also understand the importance of connected knowledge, and I try to check my own bias regularly to avoid engaging in othering and keep on striving to differentiate for my students’ individual needs. 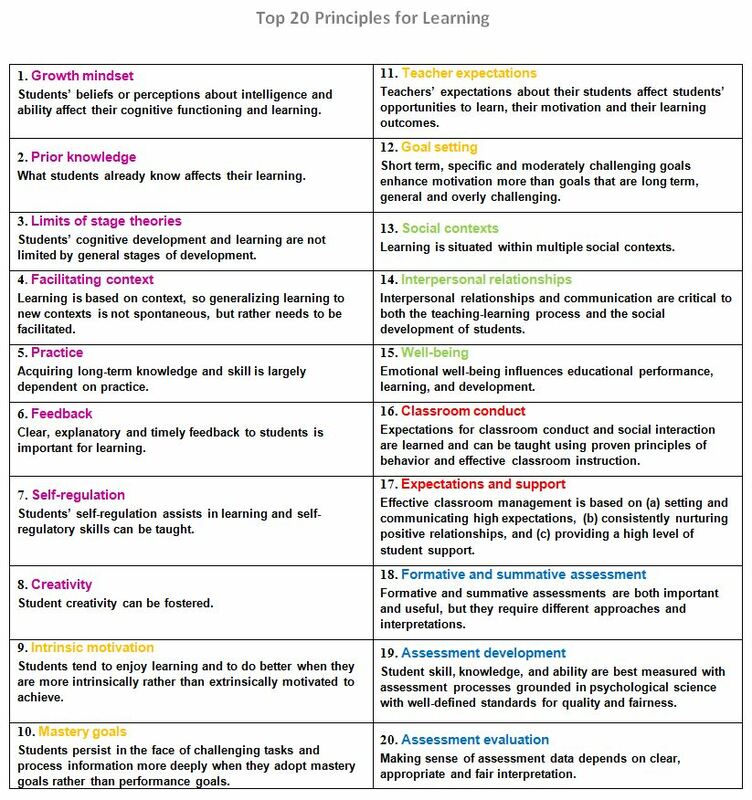 Oh… and our teaching dispositions are of course very close to our learning dispositions, but even more up close and personal. Learning dispositions regulate our learning efforts, our interests and motivation. The origin of learning dispositions is complicated, but they are partially born from our everyday learning experiences. What kind of learning dispositions you think your students are creating? What is important and valued in your classroom? 1. Viljaranta, J., Aunola, K., Mullola, S., Virkkala, J., Hirvonen, R., Pakarinen, E., & Nurmi, J.-E. (in press). The role of temperament on children’s skill development: teachers’ interaction styles as mediators. Child Development. Would you try competency-based education in your class? Competency based education has several strengths over traditional seat-based education. It supports students’ accountability of their own learning and allows students to advance in their own pace after meeting the explicit and transferable learning objectives, demonstrated by the assessment criterion (usually rubrics). Time is the first element of individualization of learning — or at least it should be. We all have our own ways of processing the information that is thrown at us in formal education. It is foolishness to imagine that all students would take exactly the same time to process things to be learned. This is exactly why I LOVE competency based education: when you are done learning one concept/topic, you can move on. Well defined learning objectives break down the skill/knowledge acquisition for students, and as a teacher (learning facilitator) I am there to ensure that nobody has to struggle too much, and that everybody has something meaningful to do, while engaging in her/his own learning process. This is how I have successfully taught on all school levels (and now work in a competency based university), and it is also the way I build my asynchronous PD courses. Personalized learning is tailoring learning for each student’s strengths, needs and interests — including enabling student voice and choice in what, how, when and where they learn — to provide flexibility and support to ensure mastery of the highest standards possible. (d) treat learners as co-creators and partners in the teaching and learning process. Changing the focus from universal delivery of information (i.e. traditional teacher-centered educational model) to learner-centered or personalized learning approach (i.e. learning facilitation) is the first step. Then, changing assessment and grading to reflect students’ learning process and engaging in non-punitive assessment model is the second step. Here is a nice table about the elements for student-centered and competency-based education. 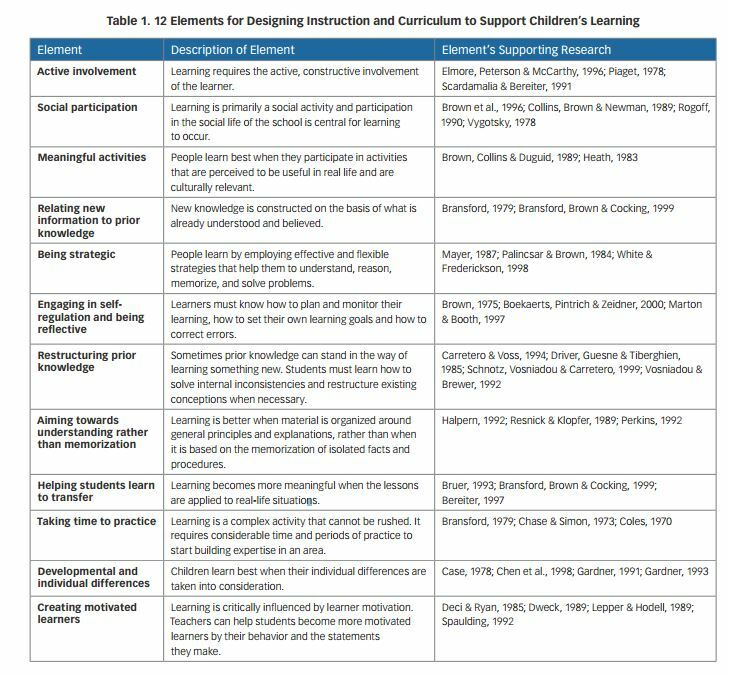 While the table discusses children’s learning, I would like to remind all readers that adults’ learning is not much different, and the same elements are very applicable in all levels of education (and training). The table and the whole document can be found here. The most Effective Learning occurs in the middle of the picture, where you can see the star. If we are missing even one piece, the star –or learning – is not complete. Students’ achievement depends on their engagement and interactions with the learning environment and the materials. Competency-based education provides tools for achieving this. Would you be willing to give competency-based education a try and change something in your current practice? 1 Patrick, S., Kennedy, K., & Powell, A. (2013). Mean what you say: Defining and integrating personalized, blended and competency education. Report, October. Learner-Centered Principles Work Group of the American Psychological Association’s Board of Educational Affairs, BEA. (1997, November). Washington, DC: American Psychological Association. Good quality assessment is an important tool for every educator. At simplest it is just informally checking how students are progressing in their learning, which can provide a nice snapshot of an individual student or the whole class. Arranging these snapshots chronologically creates a display of individual learning process. These portfolios, learning journals, or other displays are very useful in learning environments where students are not formally evaluated, but they can also be used very effectively in all educational systems. Formal education is often built on learning objectives and learning outcomes and thus assessing students’ performance is seen to be necessary. Students’ progress in formal education is tied to a curriculum and students are evaluated to see if they meet the standards of the educational system. But, to support students’ individual and self-regulated learning process we also need to have strong formative assessment practices. Formative assessment of learning is then used to inform future instruction in the class, and thus also may become assessment for learning. Classroom assessment has several requirements, though, to be beneficial for students and their learning process. The very first and the most important requirement is that all assessments are non-punitive, so that they don’t create a threat for students to engage in their learning. It is detrimental to use assessments that direct students to use shallow or strategic learning approaches! An assessment cannot be a one-shot-only situation, because that emphasizes the view of learning as a product, not a process. Criterion based (or standards based) assessment where students get try again until they reach the standard is a good option. It is important to remember that while trying to measure students’ knowledge/skill in the content, the assessment shouldn’t be focused on students’ work habits or organization skills. Including learning about executive function to lessons is a good way to improve study skills. The second requirement is that students must be included in decisions about how and what they learn and how that learning is assessed (as per APA learner-centered psychological principles). This doesn’t mean letting students to do whatever they want, but opening the discussion with students about their learning process, allowing students to choose their learning/study strategies, and providing choices for both assessments and assignments. The third requirement is for the assessment to improve the learning process, and build students’ self-efficacy beliefs while treating learners as co-creators and partners in their learning process (APA). Assessment contributes to students’ growing meta-cognitive skills, by providing feedback about both the learning and studying strategies and practices (not just the product, i.e. worksheet, paper, project, poster etc) in order to support students growth. There is a big difference in evaluating the study strategies and providing feedback about them. To be effective assessment must also inform the teacher about next steps in instruction and help the teacher to accommodate individual differences in learners’ backgrounds, interests, abilities, and experiences (APA). This also presents the requirement for providing choices in the classroom. It is a good practice to include students’ self-assessments into the formative assessment system in the classroom, because it improves students understanding of their own skills and learning when they see how well the self-assessment and formative assessments meet. And, a major discrepancy between self- assessment and formative assessment is an excellent conversation starter between the teacher and the student — in both situations when the student over- or underestimates her/his skills and knowledge – and in which case it easily becomes both an assessment of learning and an assessment for learning. And please, let’s not get confused between (formative) assessments and (summative) evaluations! One question about Finnish education that I often get to answer is about the absence of standardized testing in K-12 in Finland. While this is absolutely true, and students don’t have to be prepped for tests for several weeks, the reality is that all teachers engage in ongoing formative assessment, in order to know how their students are learning.